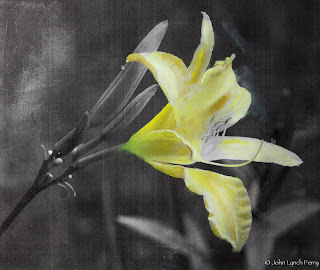 I've been on a quest since the yellow day lilies in my yard began flowering. Nearly every day there has been a photo session for reference material. Once I sat out sketching to become more familiar with details. Then I've been out there taking measurements and notes. Lastly came color studies. A hand mulled yellow, PY154, proved too warm so an order with Kremer supplied a relatively cool PY184. I also mulled up a tube of PG36 to pull any needed green while keeping the chroma high. From my studies with "Yellow and Blue Don't Make Green" as well as Munsell, these pigments promised to return nice high chroma. I created this chart to explore the possibilities. Three days work here, phew. Next I simply wanted to explore getting paint down. Rather than work on design, I selected one of my many photos, cropped, and printed on the b/w laser. I applied one coat of Golden's GAC 100 to the front side only to seal off any oil absorption and began painting on the paper taped to a panel. This is proving to be a good path for me as I get to explore tone and color in easy fashion. I can make up these printouts in minutes and they feel like wonderful practice. And if you will be working with gouache you may not even need the GAC 100!